BottleRock Napa Valley – Held each year at the end of May, BottleRock Napa Valley is quickly becoming one of the country’s premiere music festivals. The three-day festival features some of the world’s top musicians on four music stages, plus the BottleRock Culinary Stage showcasing one-of-a-kind culinary and celebrity pairings. BottleRock offers the best in wine, food and craft brews to complement the music and create an authentic wine country experience for festival guests. 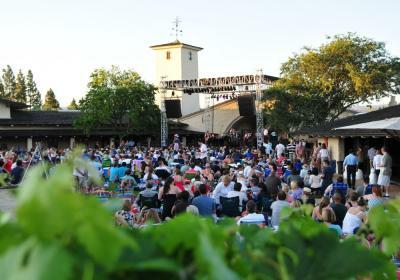 Margrit Mondavi Summer Concerts – For nearly 50 years, the Margrit Mondavi Summer Concert Series, in partnership with BottleRock Presents, offers headlining musical entertainment every Saturday in July on the sprawling grass terrace of the iconic winery. Beringer Vineyards Summer Music in the Backyard – This historic winery, founded in 1875, offers live music every Saturday between 12:30 and 4:30pm from July 1 – Oct. 28, complete with picnicking on the great lawn. The Sherry Shack is open for purchasing picnic items and wines by the glass from 11 a.m. to 5 p.m. Visitors are encouraged to arrive early to reserve a picnic spot. A Bocce ball court is available by reservation. Napa Valley Jazz Getaway: Renowned jazz artist Brian Culbertson’s annual Napa Valley Jazz Getaway is a five-day luxury wine and jazz festival featuring an all-star cast of jazz and R&B greats. Attendees enjoy dinners, wine tasting events at many of Napa&apos;s most iconic wines, and concerts at a variety of Napa Valley locations, culminating with the main event at the Oxbow Commons. Napa Porchfest: “Out of the garage and onto the porch!” is the slogan for Napa Porchfest, one of the most enjoyable days of the year, offering dozens of local bands playing on the porches of many of the charming and grand old homes in the historic neighborhoods in downtown Napa. This free event encourages attendees to walk and ride bicycles to experience Napa’s local talent and beautiful neighborhoods.